Ruth Alice Maxwell Giles was born Wednesday, July 14, 1920 in Lake, MS to William Walter Maxwell and Mary Alice Smith Maxwell. She was the baby to her three brothers, Ray, Walter Amos and Wrenty, who adored her. Ruth married the love of her life, Willie Herman Giles, in 1940 and they had three sons, Gene, Danny and Gary. They would only have 10 short years together when Herman passed away at the age of 29 after returning home from serving in World War II. Ruth remarried and she and her new husband moved to Theodore, AL in 1955. They divorced, but she stayed in Theodore where she raised her three sons. She worked and retired from Brookley Air Force Base. She then worked in the Purchasing Department at the University of South Alabama and retired from there as well. Ruth was a loving, caring mother, grandmother and friend who loved her family and her God. She loved animals and frequently picked up strays. She loved life and lived it to the fullest. She was always happy and joking; she loved making people laugh. She loved good-looking men and was still a flirt until her final days. 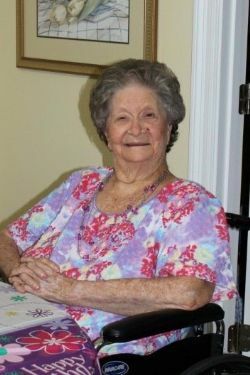 Ruth spent the last 14 years as a resident of Grand Bay Convalescent Home in Grand Bay, AL with her roommate and best friend, Francine French. This was her home and she loved it dearly. Ruth’s survivors include her sons, Herman “Gene” Giles, Danny F. (Mary) Giles and Gary B. (Holly) Giles; 8 grandchildren; 10 great-grandchildren; 9 great-great grandchildren; other relatives and friends. Ruth passed away Wednesday, January 30, 2019. We are thankful and blessed for her 98 years of life. Funeral services will be held Monday, February 4, 2019 at 12 Noon from the chapel of Mobile Memorial Gardens Funeral Home. The family will receive friends at the funeral home Monday from 10:00 AM until service time. A chapel service will be held at 12pm on Monday, 02/04/2019 from Mobile Memorial Gardens Funeral Home, followed by a committal service at the grave site.